Can you believe it's the end of January?! I sure can't. I know this post is a little unusual but I wanted to do it to connect more with you. It's not all cooking, eating, and blogging here! I'm interested to hear if anyone is trying anything or if it all just looks yummy. Patrick and I are enjoying being in the kitchen more and more and are excited to keep exploring. So without further ado here are some of my blog / food thoughts from January! 2. With that said a big thank you to Mom for trying a recipe! And also to Granny for trying two delicious sides. Granny and Mom may have a slight advantage with their printed recipes--more about this coming in February. 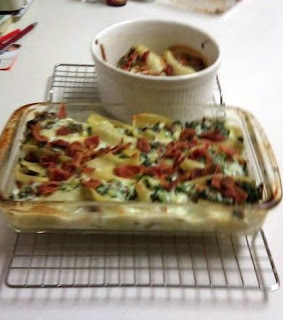 Mom's initial attempt at Spinach Manicotti 11/3/10 turned into Spinach Shells with Bacon! Her quick thinking and innovation led to this just-as-yummy-transformation. The little ol' grocery store back home didn't have manicotti so she substituted the jumbo shells and just for a little crunch she added bacon on top. The recipe made plenty of leftovers and she was even able to share with Granny and Poppa. Mom sent me a photo of her Spinach Shells with Bacon creation. So much yummyness. 3. With the premiere of Winter Wipeout comes viewing parties! My friends and I decided on Sunday nights for this season and themed potlucks! So far we've experimented with Mexican and Southern--look out for these posts and more in February. These are very convenient. Everyone brings a little something and the theme allows for all the dishes to complete a meal. 4. Patrick and I seem to have identified some of our favorite comfort food dishes. Chicken pot pie and macaroni & cheese are two dishes that come to my mind. We've prepared these dishes with several different recipes and are still settling on a favorite. Comparing our final products is much easier with the blog. It's fun to see how our processes change and which one's we're enjoying more. Maybe one day we'll put parts of one with another and start creating the perfect dish for us. 5. A quick just for fun link to a post from last January! The food blog was up and running at the beginning of last year but the posts were few and far between; our serious blogging began in the fall. Enjoy this gem from last year: Chicken Breasts with Mushroom Cream Sauce. Hopefully we'll have a search box on the blog soon so you can find past blog posts easier. After making the pork schnitzel from the Food Made Fast cookbook and raving about the series I decided to browse my pasta one. Previously when I browsed the cookbook this recipe would not have piqued my interest but now that goat cheese is my new fav I was excited to find this recipe and try it! 1. Make the Sauce: Bring a large pot of water to a boil. In a large frying pan over medium-low heat, warm the oil. Add the garlic and saute until fragrant, about 2 minutes. Raise the heat to medium-high, add the zucchini, and saute until lightly browned, about 10 minutes. Remove from the heat, add 1 teaspoon salt and the goat cheese, and toss to combine. 2. Cook the Pasta: Meanwhile, add 2 tablespoons salt and the pasta to the boiling water. Cook, stirring occasionally to prevent sticking, until al dente, according to the package directions. Drain, reserving about 1/2 cup of the cooking water. Add the pasta to the sauce along with the herbs and a generous amount of pepper. Toss to combine. Add in as much of the cooking water as needed to loosen the salt and serve. 1. There was a lot of excess oil. Next time we will cut it down a little; maybe 1/3 cup? 2. The zucchini really broke down a lot. The oil may not have been hot enough and therefore the zucchini took too long to cook. Next time will have hotter oil and may cut the zucchini in more substantial pieces rather than the small matchstick pieces. 3. The goat cheese flavor throughout the dish is amazing! The cookbook suggested serving this with salmon but it also makes for a perfect one dish meal that's light and filling. Last weekend Christine returned for a fun visit! I knew we'd be eating out a lot so decided to set aside an evening for all of us to get together and eat. Since there would be 13 of us I wanted to find a recipe that could easily feed that many people and not be too difficult. Lasagna was an immediate front runner and ultimately we decided on it! I asked the rest of the guests to chip in with the sides - a tasty salad, bread, ice cream, and some wine. Everything came together so perfectly and the night couldn't have gone any smoother. With the feast we were preparing we knew we needed two lasagnas! Originally I was just going to make vegetarian lasagna - mushrooms and other veggies in a tomato-based sauce. Well Patrick and Tim both requested some meat. Here begins the dueling lasagnas! I put Patrick in charge of the meat lasagna and I made the veggie one. There wasn't a good veggie substitute for the meat lasagna recipe in the The New Best Recipe so I winged it. It turned out really well. For the most part I followed the same recipe as the meat lasagna Patrick was preparing but substituted mushrooms and celery for the meat. I'll note this in the lasagna recipe. In this post I've included the two lasagnas, bread, and salad recipes. Be on the lookout for our dessert! 1. Adjust an oven rack to the middle position and heat the oven to 375F. 3. For the layers: Mix the ricotta, 1 cup of the Parmesan, the basil, egg, salt, and pepper in a medium bowl with a fork until well combined and creamy; set aside. 4. Smear the entire bottom of a 13 x 9-inch baking dish with 1/4 cup of the sauce. Place 3 noodles in the baking dish to create the first layer. Drop 3 tablespoons of the ricotta mixture down the center of each noddle and level the domed mounds by pressing with the back side of a measuring spoon (fork works just fine). Sprinkle the layer evenly with 1 cup of the shredded mozzarella cheese. Spoon 1 1/2 cups of the sauce evenly over the cheese. Repeat the layering of noodles, ricotta, mozzarella, and sauce two more times. Place the remaining 3 noodles on top of the sauce, spread the remaining sauce over the noddles, sprinkle with the remaining mozzarella, then with the remaining 1/4 cup Parmesan. Lightly spray a large sheet of foil with nonstick cooking spray and cover the lasagna. 5. Bake 15 minutes, then remove the foil. Return the lasagna to the oven and continue to bake until the cheese is spotty brown and the sauce is bubbling, about 25 minutes longer. (It took much longer than this for us.) Cool the lasagna about 10 minutes; cut into pieces and serve. Sliced rustic bread smeared with fancy French butter and sprinkled with Italian seasonings and garlic powder. This recipe comes via our family friend Glenda! I immediately fell in love with this the first time I tried it. Mom made it a few times over the years and I knew as soon I received my crockpot for Christmas it wouldn't take long for me to try it! For our first Wipeout viewing night we had a potluck dinner, and I made this recipe for everyone. Spray crock pot with nonstick cooking spray. Mix all ingredients except 1/2 the cheese. Pour into crockpot and top with cheese. Cook on low for 3 1/2 - 4 hours. All the ingredients mixed minus half the cheese. The rest of the cheese and sprinkled with a few red pepper flakes. Heat oven to 400 degrees. Simmer chicken in stock until chicken is just done, 8-10 min. Transfer meat to large bowl, reserving broth in measuring cup. Saute onion, carrots, and celery in heated oil until tender, about 5 min. Season with salt and pepper. While vegetables saute, shred chicken. Transfer cooked vegetables to bowl with chicken. Heat butter in same pan. When foaming subsides, add flour and cook 1 min, stirring. Whisk in chicken broth, milk, any accumulated chicken juices, and thyme. Simmer until sauce fully thickens, about 1 min. Season to taste with salt and pepper; stir in sherry. Pour sauce over chicken mixture and combine. Stir in peas and parsley. Adjust seasonings. Pour mixture into 13x9-in pan or six 12-oz oven proof dishes. Top with puff pastry; bake until topping is golden brown and filling is bubbly, 30 min. for a large pie and 20-25 min. for individual pies. Needed to cut my slits a little wider! They closed up and some filling bubbled up on the edge. This simple recipe comes courtesy of The Cook's Country Cookbook. I don't have much to say on this one, except that it tasted great and I was quite impressed with how well the pecans stuck to the chicken. Whisk eggs, mustard, garlic, tarragon, 1/2 tsp salt, and 1/2 tsp pepper in large bowl. Add chicken, coat well, cover with plastic wrap, and refrigerate while preparing the nut mixture. Pulse pecans in food processor until finely chopped, and transfer to a pie plate or shallow rimmed dish. Pulse bread in food processor until finely ground. Add bread crumbs to nuts and stir in the cornstarch, brown sugar, 1/2 tsp pepper, 1/4 tsp salt, and cinnamon. Working with one at a time, remove cutlets from egg mixture, letting excess drip back into bowl. Thoroughly coat the chicken with the nut mixture, pressing on coating to help it adhere, and transfer to large plate. Heat 1/2 c oil in large nonstick skillet over medium-high heat until shimmering. Place 4 cutlets in skillet and cook until golden brown on both sides, 3-4 min. per side. Discard oils and solids from skillet and repeat with remaining cutlets. I heard some readers just check this blog for pictures of me. Here I am! My new tongs really reduced the messiness of the dipping process. ...to the plate! Turned out delicious. Schnitzel time!! Patrick is a big fan of this German dish and this was our first attempt at preparing it. Quick tip of the hat to the German inspired bakery Guglhupf (in Durham) where Patrick gives two thumbs up to their schnitzel! 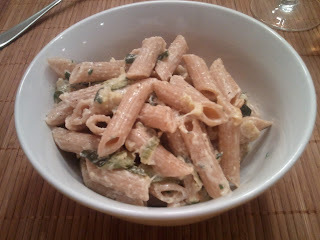 The recipe is from my new Williams-Sonoma Food Made Fast Simple Suppers cookbook. I love their Food Made Fast series of cookbook. They're easy to use and there's plenty of inspiration with pictures of every dish. I have the pasta one and the recipes are phenomenal. No big notes or comments with this one. I followed things by the recipe and didn't tweak too much. The only thing I would add next time is an extra shallot. Served the schnitzel with a roasted sweet potato. The work station. Into the flour, the egg, the bread crumbs, and then on the rack to wait for the pan. Cook the pork. In a large frying pan over medium-high heat, warm 2 tablespoons of the oil. Add the cutlets and cook, turning once, until golden brown on both sides and barely pink in the center, 4-6 minutes total. Transfer to a plate. Make the salad. Add the remaining 2 tablespoons oil to the pan over medium heat. Add the shallots and saute until softened, about 1 minute. Stir in the lemon juice, scraping up the browned bits on the pan bottom. Remove from the heat, add the arugula, and toss briefly to coat with the dressing. Divide the cutlets among dinner plates and top with the arugula mixture. Garnish with the lemon wedges and serve. Have an under-the-weather Patrick? Feed him this! This soup is the guinea pig for the new slow cooker. The recipe comes from my new Art of the Slow Cooker cookbook. Here's the recipe with my notes following in red. Preheat an oven to 425F. Toss the onions, carrots, celery, turnip, bell pepper, sweet potato, mushrooms, and garlic with the olive oil on a large rimmed sheet pan. Spread into an even layer and roast for 30 minutes, or until the vegetables are tender and lightly browned at the edges. Scrape the vegetables into a 5- to 6- quart slow cooker. Pour 1 cup of the vegetable broth onto the sheet pan and scrape up any browned bits clinging to it; scrape into the cooker. Add the remaining 5 cups broth, the diced tomatoes and their juice, the salt, pepper, rosemary, and thyme. Cover the cooker and cook for 2 to 3 hours on high, or 4 to 6 hours on low, until the flavors are blended. Stir in the parsley and couscous and cook for 5 more minutes. Notes: Roasting the vegetables definitely adds a lot of flavor. For a little extra flavor I tossed with olive oil and Mrs. Dash. After I scraped mine into the crockpot there was only a little bit of browned bits in the corner... not even enough to pour broth over and scrape up so I omitted that step. These directions are verbatim from the cookbook so I'm not really sure what happens to the whole, unpeeled garlic. It seemed odd to me to have unpeeled garlic in the final product so I ended up peeling the garlic and crushing it with the vegetables. In the future I will slice it. Once I got to the final 5 minutes and went to add the couscous I realized it was only 3 tablespoons. Patrick and I discussed this and didn't think 3 tablespoons couscous would add a lot of depth to the recipe so we opted out of the couscous and just had a plain veggie soup! To add some heat, Patrick recommends a few squirts of Sriracha in your bowl. Shepherd's Pie is a dish I've enjoyed in various restaurants, but this was my first attempt at preparing it myself. I selected a recipe from my new Cook's Country Cookbook, and cooked it in my new dutch oven. The dutch oven was a delight to use and a dish-saver; for this recipe, I was able to sauté, boil, bake, and broil in it, and then cover and transfer the leftovers to the refrigerator. Heat butter over medium-high heat until foaming. Add onion and carrots and cook until soft, about 8 min. Add meat, 1/2 tsp salt, and 1/2 tsp pepper and cook until browned, about 12 min. Add flour and tomato paste and cook until paste begins to darken, about 1 min. Add the cream and cook until it spatters, about 1 min. Add broth, beer, soy sauce, and thyme and simmer over medium heat, stirring frequently, until mixture is thick but saucy, 15 to 20 min. Remove from heat, stir in the peas, adjust the seasonings as needed, and transfer to broiler-safe 2-quart casserole dish (we just left it in the dutch oven). Preheat oven to 375 degrees. Bring potatoes, 1/2 tsp salt, and water to cover to a boil over high heat. Reduce the heat to medium-low and simmer until tender, 15 to 20 min. Drain the potatoes, return to saucepan, and mash potatoes with butter and cream until smooth. Season with salt and pepper to taste. Spread potatoes over the filling, using a spatula to smooth the top. Brush with egg and drag a fork across the top to make ridges. Bake until the filling is bubbling, about 15 min. Turn on broiler and cook until top is golden brown, 3 to 5 min. Remove from oven and cool for 10 min. Serve. The filling was flavorful, and I really enjoyed the texture of the potatoes. The topping and filling can be prepared simultaneously. Fresh from the broiler with my new oven mitts! I got a little artistic with the potato ridges. When I got home after Christmas, I was very excited to try something from one of my new America's Test Kitchen cookbooks. I settled on a mushroom pasta recipe from The New Best Recipe. The cookbook has a very thorough introduction and recipe; here's an abridged version with my notes. 1. Boil 4 qt water in a large pot. 2. Meanwhile, heat butter and oil in 12-inch skillet over medium heat. Add shallots and cook until softened and translucent, about 4 min. Add the garlic and cook until fragrant, about 30 s. Increase the heat to medium-high; add the shiitakes and cook for 2 min. Add the cremini and 1/2 tsp salt; cook about 8 min. Stir in thyme and cook 30 s. Transfer mushrooms to a bowl and set aside. Add chicken broth to skillet and bring to a boil, scraping up the browned bits on the bottom of the pan; off the heat, stir in the cream, lemon juice, and salt and pepper to taste. 3. Add 1 tbsp salt and the pasta to the boiling water and stir to separate the noodles. Cook until just shy of al dente. Drain and return pasta to the pot. 4. Add the mushrooms, chicken broth-cream mixture, cheese, and parsley to the pasta. Toss over medium-low heat until the cheese melts and pasta absorbs most of the liquid, about 2 min. Serve immediately. I thoroughly enjoyed this dish, and it made for excellent leftovers as well. Whitney had two comments. First, the sauce came out kind of thin. The cookbook says the sauce is supposed to thicken when simmered with the pasta "as the pasta leaches starch"; I'm pretty sure we cut that step too short. I do think some thickening had occurred by the time I ate the leftovers. Whitney also mentioned that the Parmesan may have been better as a topper than mixed in the sauce, although I suppose there's no reason one couldn't do both. This was a great first experience with this cookbook, and I look forward to trying more recipes. Thanks Kathleen and Alex! Happy New Year and New Kitchen Stuff! Le Creuset dutch oven (with extra oven-safe handle!) - I know how much Kathleen loves this all-purpose cooker. Used it for the first time for our New Year's Eve dinner - stay tuned to find out what it was! Cuisinart wafflemaker - Whitney also got me some Williams-Sonoma waffle mix, and our first waffles turned out great! The New Best Recipe - I love the scientific approach from America's Test Kitchen (the source of all three of these cookbooks), and this book is a wonderful first reference for cooking nearly everything. Cook's Country Cookbook - A voluminous cookbook similar to New Best Recipe, but with a focus on American home cooking. How to Make Pot Pies and Casseroles - Whitney knows how much I love pot pies and casseroles, so she got me this conveniently sized book with some great recipes and tips. Bag clips - Finally a way to reseal those un-resealable bags! Strawberry huller - How did I ever hull strawberries before this?! Hamilton Beach Slow Cooker - Santa knew exactly what I wanted! Lately I've had a craving for pot roast but no slow cooker, so here's the slow cooker! ... now on to the pot roast! Art of the Slow Cooker - Santa tipped Mom and Jimmy off that a cookbook to go with the slow cooker might be nice. Hello, Cupcake! - This cupcake book shows you how to prepare fancily decorated cupcakes with all the things you already have in your kitchen! Check out their website here. Occupied Japan china set - Granny and Poppa's gift was the biggest surprise of all. Growing up I always admired Granny's collection of Occupied Japan figurines and now I have my own collection of a different nature -- a china set! Now our nice dinner nights can have even more significance. A Visual History of Cooking - We love to cook so why not know more about the history of cooking? A fun book to see how cooking has evolved from Granny and Poppa. Salad Spinner - Washing lettuce just got a lot easier. Fancy salads on the way! A wonderful gift from the Colebrooks. We weren't the only ones happy on Christmas day. The cats were spoiled too! Albert waiting for Pebbles to get the new catnip toys open! !